In these situations, a chief aggressor’s power and influence over a group of subordinates may be sufficient to enlist their participation in mistreating a target, creating what looks and feels like a mob. For example, if the aggressor is a mid-level manager, he may recruit HR to help out with the dirty work and encourage the target’s peers to shun or bully her. To be honest, my learned colleagues who are researching and theorizing about work abuse haven’t exactly jumped on board with this concept, so perhaps I should heed the silence. However, I see the puppet master dynamic playing out in so many situations — including organizations and communities — that I’m still using the term. As I often do with this blog, I’d like to take a few minutes to share how my thinking about it has evolved, drawing on ideas and authors that I’ve discussed in previous posts. This certainly applies to puppet master bullying. So let’s take a closer look at these players. Puppet master bullies are often pretty evil. Not only are they prone to treating others abusively, but also they are willing and able to enlist others to help do the job. The latter uses fear and intimidation, promises and incentives, or some combination of all. Imagine — if you can — not having conscience, none at all, no feelings of guilt or remorse no matter what you do, no limiting sense of concern for the well-being of strangers, friends, or even family members. Imagine no struggles with shame, not a single one in your whole life, no matter what kind of selfish, lazy, harmful, or immoral action you had taken. And pretend that the concept of responsibility is unknown to you, except as a burden others seem to accept without question, like gullible fools. OK, I understand that not every workplace abuser is a genuine, clinically diagnosable sociopath. However, the key message of that passage seems to apply to so many people who mistreat or exploit others at work: They don’t have a conscience, or at least not much of one. In fact, in discussing with others the challenges of anticipating and responding to the hurtful actions of nasty, abusive employers, I often suggest: Think like a sociopath. Then you’ll get it. And so it is with comprehending many puppet master bullies. Puppet master bullying necessarily involves the willing/coerced/incentivized participation of many others. In talking to bullying and mobbing targets, one of their most common, anguished laments runs along these lines: How could they have gone along with this? Don’t they have any sense of decency? They had to know this was terrible and unfair, and yet they went along or turned the other way. In puppet master bullying situations, the enlisted individuals typically go well beyond HR and the legal department. They are recruited from virtually any setting in which the target works and interacts with others. They are the puppet master’s everyday foot soldiers in conducting the bullying. In other words, with puppet master bullying, cutting the strings may be sufficient for the “puppets” to stop their onslaught of abuse. With genuine mobbing, however, the puppets are sufficiently enlisted to continue the mistreatment on their own. Obviously we have a lot more to learn about comprehending and responding to bullying and mobbing in the workplace. I hope this has been of some help to folks who are experiencing or trying to understand this particular sordid brand of psychological abuse at work. Greater Boston is in lockdown mode at mid-afternoon of this otherwise lovely spring Friday, with law enforcement authorities pursuing the suspects from Monday’s Boston Marathon bombings. For some of us, it means a try-to-work-at-home day as we attempt to do something constructive while following news updates. Of course, this is an unsettling day for just about everyone around here. But for so many small businesses, wage earners, and service providers like cabbies, it also is a costly day of lost income, even if the reasons for the shutdown are entirely justifiable. I don’t know what political messages the perpetrators intended to send by their horrible actions, but among those paying a significant price are businesses and individuals who can least afford to do so. Big companies that can absorb a loss, and higher salary earners who will get their full paychecks regardless, will be okay, while many others will find it even more difficult to balance their books and to make ends meet. Had you been transported to Boston’s busy Downtown Crossing area at lunchtime today, it may not have been evident that just the day before, at least three people died and over a hundred were injured (many severely) by two bombs that were detonated near the finish line of the Boston Marathon, a few short subway stops away. You would’ve seen the usual scurrying about, with some folks carrying bags from quick shopping trips, and others lining up at one of the food carts for a bite to eat. Indeed, on the surface, much of Boston looked pretty normal today, the major exceptions being that part of town regarded as a crime scene and thus closed off to the general public, as well as increased security in the public transportation system. Otherwise, most offices, schools, and stores were open for business. Just another working day, yes? Hardly. You can’t see what’s going through everyone’s minds, but mark my words, very few people were not in some way distracted, anxious, preoccupied, upset, angry, or grieving. I don’t think a lot of work got done today. At this point, we don’t know who planted these bombs or why, so it’s too early to process what this all means. But Boston has been changed forever. In America, places such as Oklahoma City and New York have had to endure this on an even larger scale, and cities around the world have faced recurring acts of terrorism. Yesterday, this often insular, tribal city was forced to mature and identify with cities around the world in a terribly painful way. But very early this evening, I found myself embracing a piece of the parochialism that at times I have struggled with so mightily. 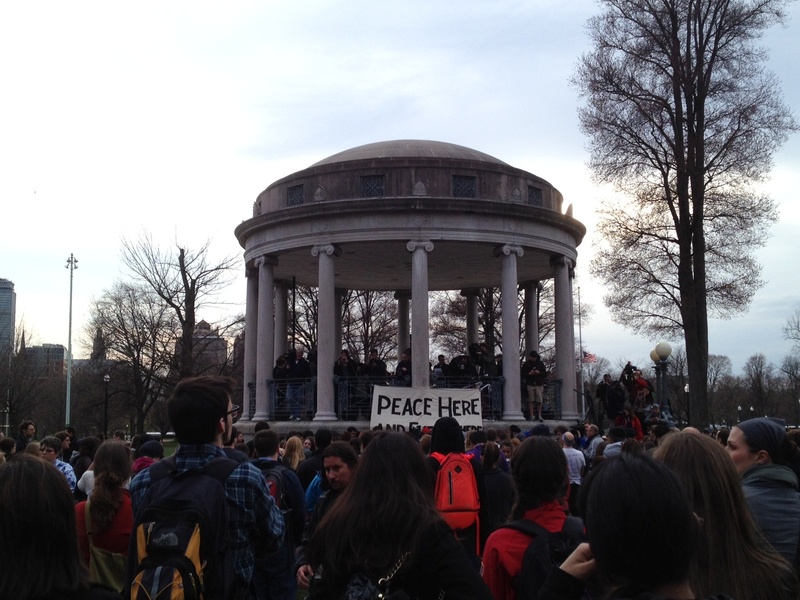 Walking through the Boston Common, I could see what appeared to be a peace vigil ahead of me and made out the sounds of a choir. I confess that my cynicism took over, as I expected to hear some 60s peace movement song, which for me would’ve rendered the gathering a bit of a cliche. No, the choir was singing “Danny Boy,” and it sounded beautiful.